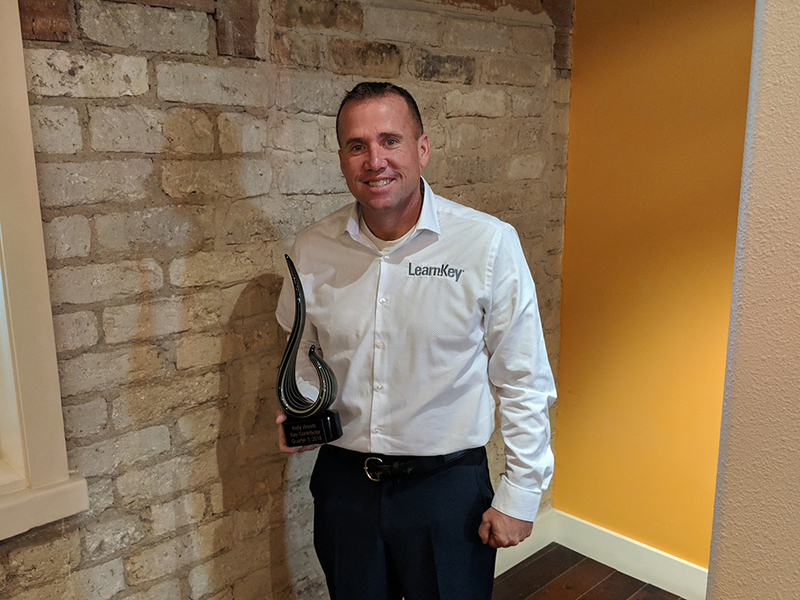 LearnKey is excited for the new year and for us to continue to grow and exceed the goals we have around our “Why” – Improving Employability Every Day. 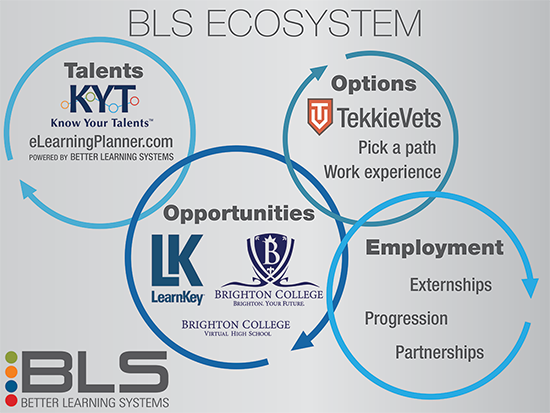 This coming year we want to see hundreds of graduates from LearnKey and Brighton College gain employment through our learning systems, programs, and strategic partnerships. 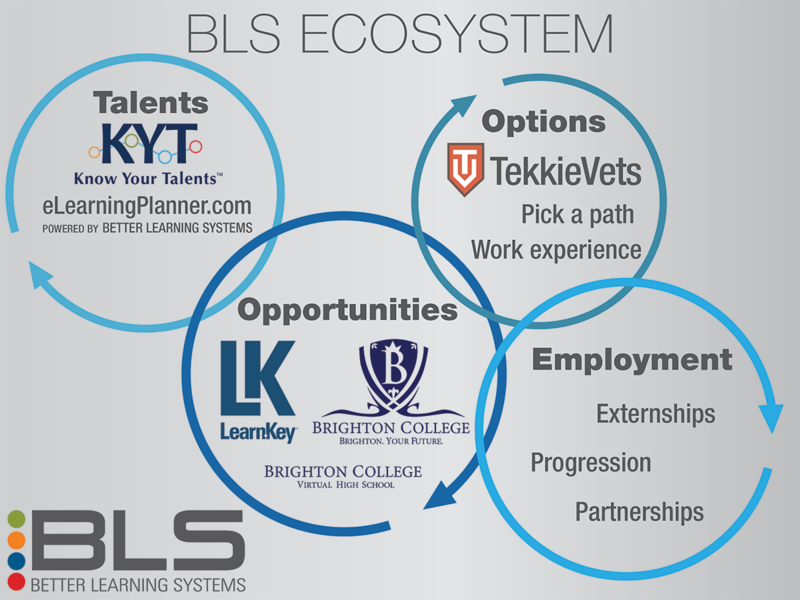 You heard LearnKey partnering with Brighton College, yes, to kick off 2019, that is exciting news. Partnering with Brighton college is a great move for us because we cater to the same student demographic. Those students interested in New Collar Jobs. With our dual alignment with Career & Technical Education programs for Information Technology, Allied Health, Legal, and Business Management it becomes a way to leverage what both our organizations are good at, which is programs that lead to in demand jobs. In the industry we saw strong growth in our K-12 Market and vocational rehabilitation programs. Globally recognized entry-level IT & Career Ready Industry Certifications are on the rise worldwide. We are seeing it first-hand and some of the most popular obtained from our student/learner demographic were tied to: Microsoft Office Specialist (MOS), Microsoft Technology Associate (MTA) , IC3 Global Standard 5, which is the newest addition to the IC3 Digital Literacy program, CompTIA’s A+, N+, and S+, Adobe, Quickbooks, and Entrepreneurship Small Business. Like all other education organizations in Information Technology, Cybersecurity continues to see strong growth with our students and adult learners wanting streamlined programs for that career. At LearnKey a Better Learning systems (check out our updated website) company, we have three big goals this year that tie directly to Improving Employability Every Day, and they are: Create a better student learning experience through upgraded learning management technology that our employees really want to use; second, do the exact same thing with our Student Information System (SIS 3.1 upgrade), again want happy employees who use our technology; and third, Improve the student progression success of our team members and students by 40%. This will drive a better learning experience which will lead to more graduates and more of our students getting hired! Exciting times ahead of us to kick off 2019. Key Contributor Award Winner- On the road again! One of the most difficult jobs is one that requires a ton of travel. It can be extremely lonely and quite challenging with flight schedules, uncomfortable hotel beds, rental cars, and meeting people that are not always as passionate about their jobs as we are. That is not the case for our most recent Key Contributor Award winner – Kelly Woods. He travels no matter what weather conditions are on his journey. See, Kelly is a Veteran, and his job is to meet with VA counselors and spread the word on how our programs help Veterans get jobs in IT, Cyber Security, Networking, Programming, Graphic Design, and Help Desk/Customer Service. When we say LearnKey truly is Improving Employability Every Day, Kelly is the face of that statement. He takes his job seriously and never hesitates to help out another Veteran or counselor when they inquire about our programs or if they need assistance along their journey. Our programs are not easy, which is why it’s important that Kelly does not mince words in that the program will be hard, but the reward will be great! 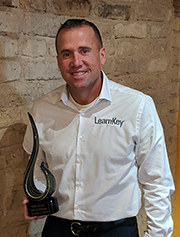 Of course Kelly attributes all our success to his supporting team members, which include the other Regional Representatives, LearnKey’s production and support teams, and the great job ready team and tutors, along with our student support representatives. It takes a team and Kelly takes pride in that he has a great team. Thank you Kelly for your contributions and keeping our core values – EASE, VALUE and TRUST – top of mind. Morocco and I had a rough start. That new normal I found in Vietnam, well, it turned into a dumpster fire. My suitcase broke, my phone broke, my phone was repaired, my phone broke again, Wi-Fi stopped working, cellular service was not available, my computer stopped charging. 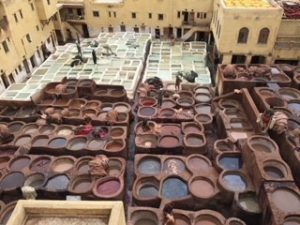 It is unclear to me if it was Marrakesh or the series of unfortunate events, or a combination of both, but I was slow to warm to Morocco. I started working during the day again. It was hard to adjust to working during the sunshine. I was enjoying having days to explore and then nights to work, and/or sleep (which is optional during remote year). The infamous tannery where all the raw animal hides are treated, dyed, and cut for various crafts. The smell was intense. The landscape is reminiscent of a young, less developed southwestern United States; wild west with a mini-modern city stretched out, painted the same colors as the surrounding, scattered with a casino, an occasional tumbleweed, and a mall with a Chili’s. Baby back ribs, anyone? The old square is where most of the shopping happens. It is bursting with life! Jemaa el-fnaa, the medina or old city, is city jam-packed with trinkets, artisanal crafts, exotic foods, and spices. 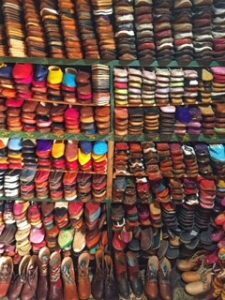 Leather Baboosh, aka Moroccan slippers are very common artisanal crafts in the Medina. I am blown away with the languages people speak, especially in the market! Arabic, French, English, Spanish! The majority of the people were at least bilingual, often trilingual. The best salesmen spoke, what seemed like every language and could guess where you were from just by looking at you. 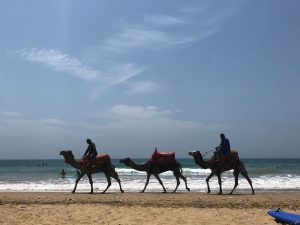 In Taghazout, camels cruising the beach were just as common as tourists. For a small fee, you can go for a quick ride and take photos. in opening me to the appeal of the country, but it never quite felt like home, even a temporary one. Anyone for a magic carpet ride? 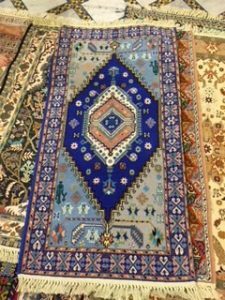 Artisanal rugs made with the Fez blue cobalt. During Ramadan, Moroccans fast between dawn and sunset as worship to God. Because there is no separation of church and state, it is illegal for a Moroccan to eat during the day. 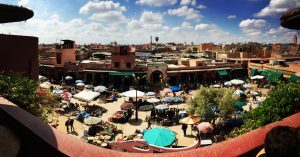 We have a couple of people in our RY group that could have been mistaken for Moroccans; they were advised to keep their passport on them in case an issue arose when they were eating or drinking in public. Reminiscent to the dedication during Thaipusam in Malaysia (March’s blog), I am impressed by the dedication that our local friends have for their religion. They describe Ramadan as a time to reflect, become closer to God, and abstain from eating to unify the rich and the poor. I decided to try the fasting for two days. Day one, I brushed my teeth for 10 minutes as an excuse to try and put moisture back into my mouth. I was sure not to ingest as that would be cheating. No water, no food, all day long. What was I thinking!? A few other girls in the group were fasting in solidarity and around 8:00 P.M. we all met at my apartment to break our fast. It was like Christmas. We sat around the table and enjoyed the traditional meals for breaking the fast. Dates, Harissa (Moroccan soup), milk, and Chebakia (a honey-soaked Moroccan cookie) filled our empty bellies. I thought we were all going to stuff our faces as fast as we could, but we each took time to taste every bite. We sat around for hours and chatted, and of course, drank as much water as we could fit around all the food. Day two was much easier. I had the traditional last meal before sunrise, which I did not do the first night. I stayed awake until 3:00 A.M. just to eat and drink one last time. I had an unusual amount of energy on day two and once fast broke, I only ate a few things. Dates, more cookies, and a small piece of chicken. It was an incredible experience, both challenging myself, and being able to relate to those fasting for an entire month. Tajine all around! Also pictured is the Moroccan salad and the beautifully crafted Moroccan dishware. 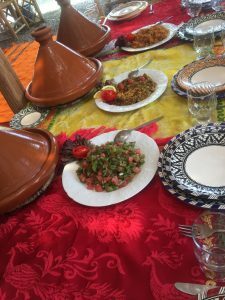 In addition to the Ramadan foods, Morocco is filled with incredible flavors and diverse food selections. Tajines – a version of a Dutch oven and refers to any meats cooked over coals, low and slow. Msemen – the BEST pancake, thin, soft, and pillow-y served with Amlou (almond butter with argon oil) and local honey. The TEA! Mint tea, tea time is very important. It was a time to slow down and enjoy time with others. The higher you pour, the better. The workspace was far away from our apartments and awkwardly quiet, I think I used it twice. I worked from home mostly as it took a lot of effort to go out as there was no Uber (this was the first location with out it), taxis seem to always want to swindle you, and I worked weird hours. It was weird working during the day again. I found myself adjusting to work late into the evening without even meaning to. It may be that I am more productive at night, or I may have never adjusted to the local time. Low Atlas Mountains passing through on the way to the Sahara. Reminded me of Sedona, AZ. 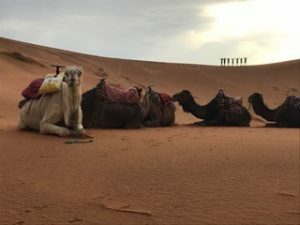 The final farewell to Marrakesh and our 100-day celebration (100 days of being on remote year), brought the community back together at the end of the month, which had seemed to be a little disconnected. With our sense of community revived, we set out for Croatia and a month by the sea. 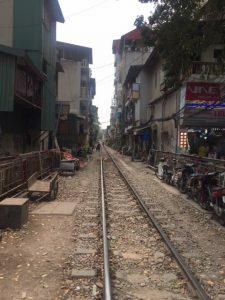 Tracks run straight through the city of Hanoi. Markets form along the sides and must move when a train goes by. I arrived in Vietnam on Saturday, March 31st! Hanoi is a busy, chaotic, energetic city exploding with eastern culture. It’s incredible, the kind of Asia I have been looking for. Until now, I have felt the previous destinations were so westernized, and have enjoyed them, but was looking for something with more shock. Vietnam is that something more. Everything in the city is risky. 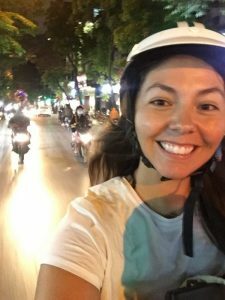 Crossing the street felt like you were swimming through a heavily populated school of fish but instead of water you are swimming through “zebra crossing,” in the concrete jungle and the fish are thousands of motor bikes that swarm around you. Stay at a steady pace and just keep walking, it may not comfortable for everyone, but once prepared, it is an energizing adrenaline rush. Eating street food is risky because of high potential for food poisoning or because of the police coming by to usher people and tiny tables off the sidewalk. If they came by in the middle of your meal, you would have to grab you table and food and pretend to move inside until they left. If you were lucky, they just did a quick drive by. In the previous cities we had Uber as a transportation option, here it is Grab Bike, a motor bike shared with a local driver. They offered a helmet so the risk of injury is slightly lessened, until they just drove on the wrong side of the road. 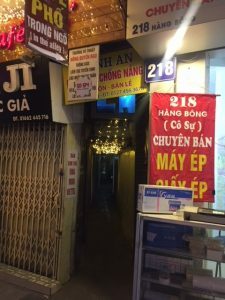 This alley way opened to a string of restaurants! A little scary entering but treasures lie within. Because of the French colonization, the architecture is colonial, bursting with life down tiny alleyways, that would open to a beautiful maze of skinny, tall story homes where the ground floor served as their place of business and the floors above where the multi-generational families live. Each mini-street has a different craft, party city street, bike repair street, food street, lamp street, plastic container street, casket and flower street, small appliance street, like a Vietnamese version of Home Depot disorderly organized around the city. The culture is a combination of everyone out for themselves and a strong sense of community. The sidewalks are where the community gathered. They were for everything but a walkway. Sidewalks were filled with live roosters, dead roosters, dogs chained up, crates filled with various small animals, millions of motor bikes both parked or driving around the obstacles, tiny baby furniture, blood, haircuts, shaves, markets, dead fish, you name it, it is happening on the sidewalk. This walkway was created by calcification from both stalactites and stalagmites connecting creating this giant structure. We were lucky enough to get out of the city we trekked through the wildly unexplored jungles and national parks. Jungles, trekking to the caves of Hang Va, where we learned of the Son Dong cave system that is still unmapped and mostly undiscovered. 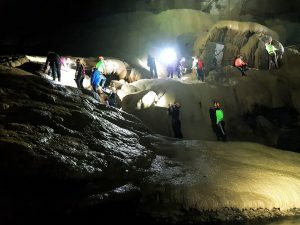 The caves we entered have been explored by less people than have summited Mount Everest. During the trek to the caves I was overcome with emotion when I thought of the young Vietnamese and American soldiers trekking through the jungle during war. The thick overgrown jungle, sharp rock formations, and muddied ground made up the path that we followed. I couldn’t imagine fighting a battle in these conditions. Respect and admiration for our Vietnam war vets filled my heart. Inspired when I returned to the city, I went to prison. The Hao Lo Prison, known as the “Hanoi Hilton,” where we saw pictures of the pleasant time the POWs had during their stay, like a lovely Christmas celebration, or friendly basketball and volleyball games, did not seem to add up when you compared that to the emaciated figures they had when they were released. Interesting perspective. I am sure the truth is somewhere between the American version and the Vietnamese version. 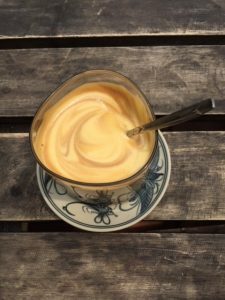 Hanoi Social Club and Lifted Café are a delish break from eastern foods with items like mango French toast, Social Club Burger that rivals most restaurant burgers in the US, and the happy hipster avocado toast. Tam Coc is located in Ninh Binh, location where Kong was filmed. Vietnamese coffee foamed up with egg white and sweetened with sugar, appropriately named Egg Coffee, was addictively satisfying. 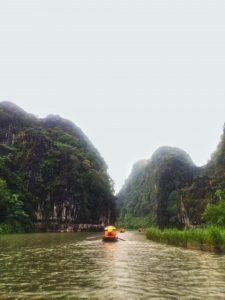 Our boat rower in Tam Coc is informing us of the favorite foods in the very little English he could speak, eating dog, cat, goat, pig, and sugar cane that tasted like a slightly sweet bark or a tree. I thought dog and cat would be to… exotic for me, therefore I had to pass on the consumption. This month I lived three lives. One life last month of night shift work, another life was a social life with the RY Kanyinis which dipped into the night shift work life, and an independent life, thanks to the accessibility of Grab Bike (and of course, the Internet) to jump into my own adventures. Until now, I have relied heavily on the RY program and its events/planning. Utter joy on the back of a Grab Bike. Building my experience was not lacking negative emotions. I felt a weird pressure when I was not doing enough of the touristy stuff, or exploring the same things that other remotes did, or even liking the same things as much as others did. But then, I had a candid little chat with myself, saying, “you’re not a tourist. You came on Remote Year to immerse yourself into the local cultures. To challenge yourself.” Duh, and like that, a switch flipped, I felt more open to be myself, let my guard down, became more conformable. I spent time exploring the city, hung out with people that I did not typically, and found my new normal. 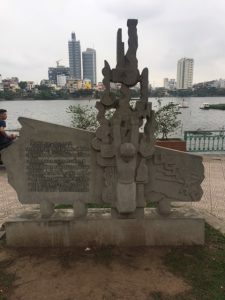 I am not sure if it has been because of the time on the program (like dog years, remote year time is the 1-year equivalent), my enjoyment of Vietnam, or some cosmic force, but I have felt like a citizen of the world, acclimating to this city as if it was my own. Now, I look forward to seeing what Africa has to offer. One of the benefits to LearnKey’s video-based training is the ability to address multiple learning levels in the classroom, utilization of scenario-based learning, and the ability to use GMetrix practice tests for each certification course. This gives students more hands-on experience. *Source: InformationWeek, January 22nd, 2018 article, “Ten most In-Demand Programming Languages of 2018” cites many sources. “Certiport” and “IC3” are registered trademarks of NCS Pearson, Inc. in the United States and other countries. The names of actual companies and products mentioned herein may be the trademarks of their respective owners. As we kick off the new year at LearnKey there is alot of excitement. We recently had everyone in the company write up their 2018 goals (i.e. courses released, students gaining certification/graduation/employment,etc.) and by the looks of it, we are going to be a big year. We plan on adding new offerings (i.e. language localization) and will be enhancing some of our courses with other learning facilitators. Each month I will share a status on one of our goals. This month it is industry certification. Last year, we exceeded our goal, having our military veteran students achieve over 658 globally recognized industry IT & Career Ready Certifications in CompTIA, Microsoft, Cisco, Adobe, Windows, IC3, and more! That was a great accomplishment, as it aligns with our true “Why,” which is Improving Employability Every Day. This is a big one for us because it is a team effort to make sure our students succeed. Next year’s goal is to exceed over 800 certifications. Additionally, we expanded our offering of courses available through Certiport and on the GMetrix Platform, enabling thousands of other students in college and K-12 to have access to our certification courses. 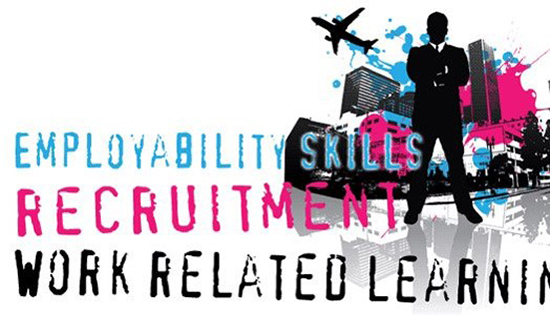 We continue to see increased demand for soft/employability skills training with some of our most popular titles on Job Hunting in a Digital World, Know Your Talents, Making a Good Impression, Resume Skills, Business Ethics on the Job, and Be Careful Before You Click! Speaking of soft/employability skills, be sure to read the article on “The surprising thing Google learned about its employees and what it means to today’s students”. Very interesting in 2013, Google decided to test its hiring hypothesis by crunching every bit and byte of hiring, firing, and promotion data accumulated since the company’s incorporation in 1998. Project Oxygen shocked everyone by concluding that, among the eight most important qualities of Google’s top employees, STEM expertise comes in dead last. The seven top characteristics of success at Google are all soft skills: being a good coach, communicating and listening well, possessing insights into others (including others different values and points of view), having empathy toward and being supportive of one’s colleagues, being a good critical thinker and problem solver, and being able to make connections across complex ideas. These skills are in demand at every level of an organization, which is why we are dedicated to making sure our Video-Based Digital Media Library of courses has over 225 titles on those important skills. Our next big course release is CompTIA’s Security+, coming at the end of this month. We are really excited to make that available as this is one of our signature courses. You can find more info on our 2018 course release schedule here! Here’s to a great start in 2018 and check back next month for another update. 2017 Best Training ROI for your employee’s and customers? It is all about better communication resulting in a better customer experience. It’s a no-brainer that bad customer service will cost your company business. But it turns out employees’ behavior toward each other can affect your bottom line, too. So the question is: are your employees properly job ready trained in the areas of dealing with difficult customers, meeting consumer needs, the art of customer service, listening under pressure, workplace ethics, email etiquette, social media at work, and bullying in the workplace? A well-known study of retailer Sears revealed that a five-point improvement in employee attitude results in a 1.3% increase in customer satisfaction, which then drives an 0.5% increase in company revenue. Which is why LearnKey’s 2017 video-based training series on customer service is the perfect solution for your organization. It’s relevant for today’s workforce, high quality, available anytime/anywhere, and can help you deliver a solid ROI for both your business customers and, most importantly, your employees. What is customer experience and why is it important? Customer experience is your customers’ perceptions of how your company treats them. These perceptions affect their behaviors, build memories and feelings, and may drive their loyalty. In other words, if they like you and continue to like you, they are going to do business with you and recommend you to others. Note: If one of your customers has a bad experience there is less than a 10% chance they will tell you about it, but they will choose not to do business with you in the future. Why should you focus on improving your customer experience? According to a recent walker study, by 2020 customer experience will overtake price and product as a key differentiator. By now it should be clear that customer service can no longer be relegated to the basement of your brand’s focus. It must be front and center of your organization, alongside marketing, as a priority focus for customer interaction and retention. Contact us today for a no-cost proof of concept on how this training can improve your ROI. Great leaders know the importance of continuous education for their employees: “Train people well enough so they can leave, treat them well enough so they don’t want to.” – Richard Branson, Founder Virgin Group. As retention and staff development continue to challenge service companies specifically in the areas of customer service, IT help desk, and front & back office support, we are actively helping our customers solve that problem, as well as improving retaining employees and enhancing their current skillsets. A majority, 57%, predict that employers will increase education benefits more than traditional benefits in 2017. Evidence exists that this could be a powerful way to boost retention and keep people from job-hopping as much as they might otherwise in today’s economy. 71% predict that partnering with outside training providers will be the best strategy to get ahead of the widening skills gap. What’s interesting given the projected education-as-a-benefit trend is that many have noted that the skills gap is not entirely caused by educational organizations inadequately preparing students for today’s jobs, but also by employers retreating from investing enough in the training of new employees. Let us schedule a demo today so you can learn how LearnKey’s experts can customize career pathways for your employees by leveraging our digital and video-based training library that covers topics in the areas of Technology, Customer Service, Professional Development, Microsoft office, and more. Today we are excited to announce that LearnKey will begin production next week on an “Exam Ready” video-based training course that maps to Certiport’s Entrepreneurship Small Business (ESB) certification and will be available in April 2017! This course will be authored by Wyett Ihler, certified instructor who has produced LearnKey’s IC3 GS5 & Spark courses over the past year. This course will help students/adult learners and teachers prep for the ESB certification exam, which is a 50-minute exam with 45 questions covering the following objectives: The Entrepreneur, Business Management, Starting a Business, Business Operations, Marketing/Sales, and Financial Management. In addition to the course being available on LearnKey’s OnlineExpert Learning Management System, the course will be available through our strategic partner GMetrix‘s skills management system. We are thrilled to offer such an exciting and in-demand certification training, as the U.S. Department of Labor and the National Foundation for Teaching Entrepreneurship (NFTE) both cite statistics that underscore the benefits of entrepreneurship education. These benefits include improved academic performance, school attendance, interest in attending college, an increase in occupational aspirations, as well as leadership behavior. LearnKey is all about helping learners improve their employability skills and this course covers an important topic that currently has no certification/validation of skills tied to it. As we start the new year it’s a great time to remind our learners, students, teachers, and career counselors about the two (2) key ingredients that ensure we focus on our “what we do”: Improving Employability Everyday. At LearnKey we believe that our passion around “what we do” and our “descriptive behaviors” is what drives our culture. Every team member in our company knows that our “What we do” is aligned to these three words: Improving Employability Everyday. We started redefining our true purpose as an organization through Simon Sinek’s The Golden Circle, over three years ago and truly believe it is the fabric, along with our descriptive behaviors, that drive our culture. We are so fanatical about this belief that any new employee team members (i.e. welcome most recently: Neil Olsen and Nina Sepulveda) must know that they must possess these key behaviors and understand “The Golden Circle” BEFORE they are even hired. Because the moment they start, that accountability to our customers and team members begin. “Why”: Dreams fulfilled through better learning. “How”: Personalized learning solutions that teach job readiness skills, leverage your natural talents, and are aligned to in-demand careers. Be a fanatic about response time. People expect us to respond to their questions and concerns quickly, and rapid response is one of the easiest and best ways to stand out. Set clear expectations. So there are no misunderstandings, and remember to clarify all the time. This avoids any miscommunications. Welcome innovation. Creativity in our products and offerings can be produced and packaged differently to meet customers’ needs. Be a great listener. Understanding expectations and customer needs is the way we want to do business. The best talker is a good listener. Do your homework. Be prepared for customers, product ideas, referrals, team member support, and the best way to show you’re serious. Be a problem solver. Solve a problem, fill a need, is how we should do business with customers and in assisting other team members. Leverage team members. To get things done, meet deadlines, and fulfill customers’ needs. Two heads are better than one. Welcoming in the new year is a good time for me to give thanks to our team who, day in and day out, commit to themselves, as well as the learners, counselors, and teachers we support that “what we do” is focused on Improving Employability Everyday. Also, a special thanks to Simon Sinek and the CEO’s of Vistage Group 508 who remind me all the time how important it is to have our message clear and concise.